Before the turn of the century Lymm boasted two morris teams; one based in Lymm itself, and the other at Oughtrington. 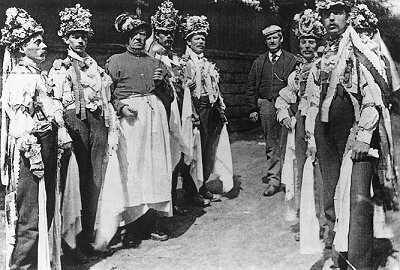 Only the Oughtrington team continued to dance into the 1900's and this became the only troupe of Lymm Morris Dancers, and it was thought that this surviving troupe had ceased to dance by the end of the first decade. Thomas Brooks of Mosley Farm, Statham, died 26th May 1923, aged 77. Thomas Brookes of Lymm, died 2nd July 1897, aged 56. As the 1900 edition of Ardern's Guide to Lymm and District states that both Tom Holt of Sandy Lane and "well-known Lymm fustian cutter", Thomas (Dossey) Brooks (leaders of the Oughtrington dancers and the Lymm dancers respectively) are "both now dead", then "Dossey" Brooks must be the Thomas that died in 1897, in spite of his name being spelt with an e on the records, and without the e in Ardern's guide. The Warrington Guardian reports that on Whit Thursday June 7th 1900 "Miss Sarah E. Boond", of Eagle Brow, was the May Queen. The Royal Maypole Dancers, Circassian and 'Skirt' Dancers are mentioned as taking part in the Band of Hope Celebrations, which this year again involved most of the local churches. Whit Thursday was on May 30th in 1901, The May Queen was Ada Johnson and the only dancers mentioned in the procession are the Royal Maypole Dancers. During the last few years, and into the early 1900's displays of trick cycling by individuals and by groups of formation riders has become a feature of the "Lymm May Queen" festival. Monday August 12th - Non-conformists to Colwyn Bay. On Whit Thursday May 22nd 1902 the festivities were arranged solely by the officials of the Lymm Congregational Church. The May Queen was Miss Gertrude Rigby, daughter of Thomas Rigby of Rush Green. Although there was torrential rain throughout the day the programme was followed fully. In 1903 Whit Thursday June 4th the tradition of having the previous May Queen as a Rose Queen was begun, the first Rose Queen being Gertie Rigby. The May Queen was Miss Annie Miller. As well the Royal Maypole Dancers, "American Harvest Dancers" performed in costumes decorated with flowers. The 1903 Rush Bearing Saturday and Monday were on the 8th and 10th August. "Cheap trips induce people to go abroad rather than patronise the fearful hobby horse or the giddy delights of the high swing. Even the morris dancers are reduced to one troup, and those boys, in place of two serious parties of gaily-bedecked men. Instead of being gay with noisy organs and shows, Lymm this last week-end was in quite the normal condition, except that old Lymm Greys visited their friends and deplored the decline of their festival." In 1904 Whit Thursday was May 26th. The May Queen was a Miss Bradbury, the Rose Queen being Annie Miller. In addition to the Royal Maypole Dancers there was a Chinese juggler, a tight-rope walker by the name of Perini and Miss Winterburn of Corlett's Academy in Manchester trained twelve "Old English dancers". On the 1904 Rushbearing Saturday 13th August the Morris Dancers paraded the streets as usual in their "gay head dress and bright coloured ribbons", and the Free Church Rushbearing Monday trip was to Blackpool. Many of the churches had stopped participating over the previous years, and the Congregationalist Band of Hope was eventually in sole command. In 1905 the event did not take place and although the event was revived again in 1906, the show was very poor. There was no mention of the Lymm May Queen celebrations in the Warrington Guardian of 1906, though Alice White was the May Queen, as mentioned in the Guardian of 1907. ".....as usual the Morris dancers paraded the village throughout the day"
This year also saw the revival of the Rushcart although no rushes were carried. The celebrations continued to be on the Saturday, as the Rushbearing Monday was established as the day for seaside trips. On Monday 13th the outing was to Blackpool. 1907 was something of a revival of the Whit celebrations: all churches were invited to attend, and most did. There were about 5,000 visitors to the village on the day. As well as the Maypole dancing, the famous Knutsford Dancers attended, and there was a Tambourine Dancer and a cycle parade. Although the weather was not brilliant, the Whit Thursday May 23rd May Queen Festival proved a success. Miss Ethel Mullineaux was the May Queen and she was, according to the Warrington Guardian, "a daughter of the force", her father being Acting Sergeant Mullineaux of the Cheshire Constabulary. The Guardian also reports that "the last May Queen ...... Alice White was also a daughter of the force" - her father was Mr. Mullineaux's predecessor. The 1907 Rushbearing was also something of a revival. The big day was the Rushbearing Saturday August 10th, "a brilliant revival of Ye Olde rush-bearing festival at Lymm". The Warrington Guardian reports that a rushcart was used for the first time in 20 years (that would be 1887) although no rushes were carried (although the newspaper reported that a rushcart was used last year!). The procession left The Cross at 3 o'clock and the team of the "winning" rushcart was "augmented" by a fine pair of grey horses lent by Messrs Greenall, Whitley & Co. "The old - fashioned morris dancers were picturesquely attired". Note: Mr. James Ashley, a farmer of Latchford, lent a horse that had assisted in pulling the cart 20 years ago, for Henry Daniels, an 89 years-old Lymm resident, to ride in the procession. Mr. James Shepherd and Mr. W. West were the main organisers of this revival. On Whit Thursday June 11th, the 1908 May Queen was Miss Ada Jones of Higher Lane, Lymm and the Rose Queen Ethel Mullineaux. The Morris dancers performed in the streets on Rushbearing Saturday 10th August and the Rushbearing week trip on the Monday was again to Blackpool. Whit Thursday was on the 3rd June in 1909. The May Queen was Emma Dixon of Statham - the Rose Queen being Ada Jones. As well as the Maypole Dancers and various other troups, "The Knutsford Celebrated Dancers" attended, but no dancers described as morris dancers. 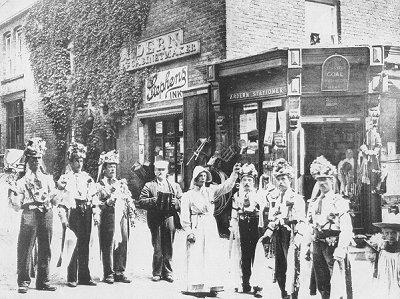 On August 14th 1909 - Rushbearing Saturday - the morris dancers again danced in the streets of Lymm. In 1910 there were garland dancers as well as the Maypole dancers at the festival on Whit Thursday 19th May and these were all female. The May Queen was Ethel Williamson and the Rose Queen Emma Dixon. Of August 13th 1910, the Warrington Guardian reported - "The ancient glory of Rushbearing dies hard. As in years passed the Morris dancers perambulated the village on Rushbearing Saturday in their gaudy dress to the huge delight of children and visitors." 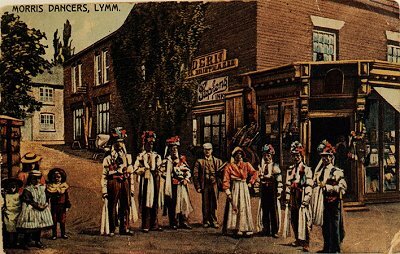 Lymm May Queen Festival did not take place after 1914 and re-started in 1919. By this time the Statham celebrations established in 1911 had stolen the limelight.